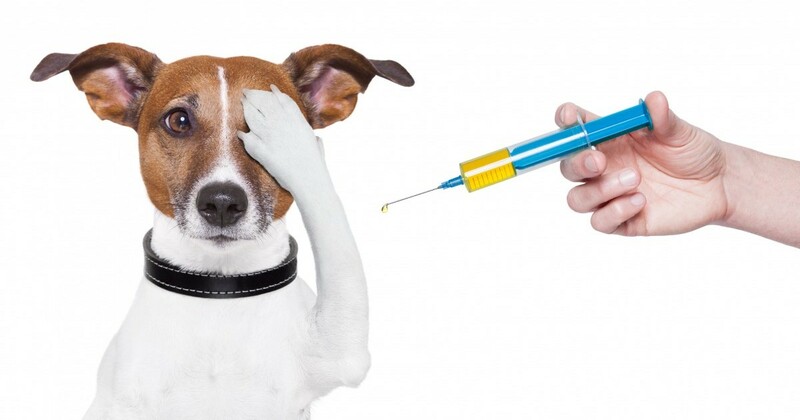 Does titre testing mean dogs and cats need a lot less vaccination? That’s certainly what you read online. The truth is more complicated than that. I’m not here to criticise: titre testing has an important role in protecting dogs (and cats- see below). But there are also some important myths and misunderstandings that need to be cleared up if you want to make an informed decision. Titre testing, or titer testing in the USA, is the use of antibody levels from a blood sample to decide if an animal needs vaccination or not. Instead of just giving vaccines at the scheduled intervals, it allows a vaccine to be skipped and avoids the risk of over-vaccination. To explain, look at the graph which shows how immunity might be lost after a vaccine. To protect every dog, we need to give the booster when the first dogs start losing immunity. That could be where I’ve put the red arrow, even though at least 95% of dogs don’t need it yet. Up to now we’ve not been able to work out which dogs they are. Titre testing could identify these dogs, and show that the others are OK.
You can see why this sounds great to many people, and why there’s a lot of excitement. We get so many enquiries that it’s time to explain titre tests properly. Choosing titre testing is about weighing up the pros and cons. Over-vaccination is the idea that too many vaccines can cause illness. The point of titre tests is therefore to be able to see if a dog really needs a vaccine. Most of the time they don’t, but without a test you’re playing Russian roulette. Do vaccines cause illness though? Most vets would say there isn’t enough of a problem to be concerned, but plenty of dog owners feel otherwise. If you want to explore this topic in more depth, I’ve written a whole article about vaccine reactions in pets. Titre levels have never been tested. Vaccines undergo challenge studies where real dogs are given real virus to show that they work, but ‘protective’ titre levels are only theoretical. We also don’t know what these titres mean for the newer strains of parvo. Of course, this doesn’t mean that they are wrong, just less reliable. There are two arms of the immune system. Titre tests only measure antibody-based immunity. For some diseases, cell-mediated immunity is the more important, and so we are assuming that an adequate antibody titre means adequate cell-mediated immunity too. It’s probably true, but it’s still only an assumption. My concern is that this might make people stop vaccination but not keep up the essential regular titre testing over a dog’s lifetime. Titre tests are only available for parvovirus, distemper and hepatitis. However, social dogs in towns and cities in Australia need canine cough vaccination too (read about each disease by following the links). Canine cough is common, and vaccination is always annual. In our clinic, we use a triennial parvovirus, distemper and hepatitis C3 vaccine and an annual canine cough vaccine to make it up to a C5. If a client chose to start titre testing, the only change would be that their dog may not need the C3 part of the vaccine every third year. Titre tests are also available for herpes, calicivirus and panleucopaenia in cats via Gribbles Veterinary Pathology in Australia. As there is no in-clinic test kit, prices are approximately double those of dogs. So what situations are best for titre tests? Certainly, the number one reason is for dogs and cats that have had genuine vaccine reactions in the past. In practice, titre tests are mostly requested by people who want to avoid vaccination as much as possible. That’s OK: titre tests are a lot better than doing nothing at all. Then there are the dogs with unknown histories, such as at shelters. They could be titre tested on arrival. However, as shelters always need to keep costs down, I’ll bet they’ll prefer to give a vaccine regardless. However, for average dog owners, I generally find that once I explain what I’ve said here, they prefer to continue using vaccines. Remember, a triennial program already reduces the vaccine in question by two-thirds. Lastly, I promise you that we’re just as happy for a dog owner to make any decision, if it’s an informed one. As long as you still bring your dog in for annual health checks, we’ll be happy vets. my pup had a C3, then a C5 and the vet I go to in Qld wants to give a C4; my question is as she had a C5 which I believe incorporates the C4, should not her her third vaccination only be another C3 am I correct or not. Hi Robin – The issue here is probably both of the variation in vaccine label claims and the preferences of each vet. However, there is also likely to be a price difference based on the bulk price that a vet gives a breeder versus the price for an individual vaccination (which includes a consultation fee). In your case, a few thoughts come to mind. If the C5 did not include an intranasal kennel cough vaccine, then in fact it needs to be a C5 that is repeated, not a C4 unless you want incomplete vaccination. Of course, kennel cough is not the most essential part of the vaccine, but it is still important. Secondly, Protech vaccines have a label claim of protection against parvovirus from 10 weeks of age. Therefore, although I certainly recommend a 16 week shot as well, you are welcome to decline a third vaccination based on the label claim. That means if there is a vaccine failure and the vaccine was given under correct circumstances, it is probably the vaccine manufacturer who is liable. Lastly, there is probably no great difference in performance between Nobivac and Protech vaccines, although personally I use Nobivac. I’m sorry if this just makes it all seem more confusing! Next PostNext Dog & Cat Food: Are Expensive Foods Better?